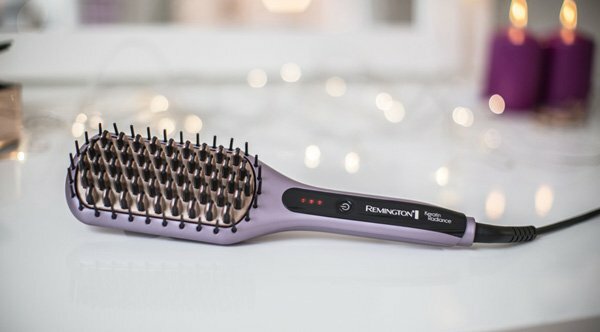 If you’re looking to add some speed to your morning routine, the Remington sleek and smooth ceramic straightening brush will easily act as the best straightening brush for you! In fact, nearly everything about this brush works faster than others on our list. For starters, the straightening brush reaches its max temperature in a quick 30 seconds. And if that’s not enough, you’ll learn how to use this brush fast as it’s pretty basic—you’ll only find a power button—which you’ll push multiple times to select your desired heat. And of course, you’ll find the large brush head allows you to straighten large portions of hair at once—saving you plenty of time when compared to the typical flat iron. Speed aside, this brush does do a pretty good job of styling your hair. As far as heat settings go, you’ll find three different temperatures (150-degrees C to 230-degrees C)–each indicated by an LCD dot on a screen. Overall, this will present you with enough flexibility to handle just about any hair type—from fine to afro-hair. To make this even better, the ceramic plates are located close enough to each other that heat will distribute evenly through your hair. But be careful at higher settings, as we found the back of the straightening brush becomes pretty hot at the top two temperatures. Alongside some great settings is the overall design. As a whole, the pink colouring does look attractive. Also, the straightening brush does resemble a typical hairbrush—which is not a bad thing by any means. And who could complain about an easy to use hair straightener? You adjust the heat by pressing the power button multiple times–that’s it! You won’t find any complicated controls here. Furthermore, should you leave the brush unattended for more than 60 minutes, the auto-shutoff feature will activate as a nice safety touch. 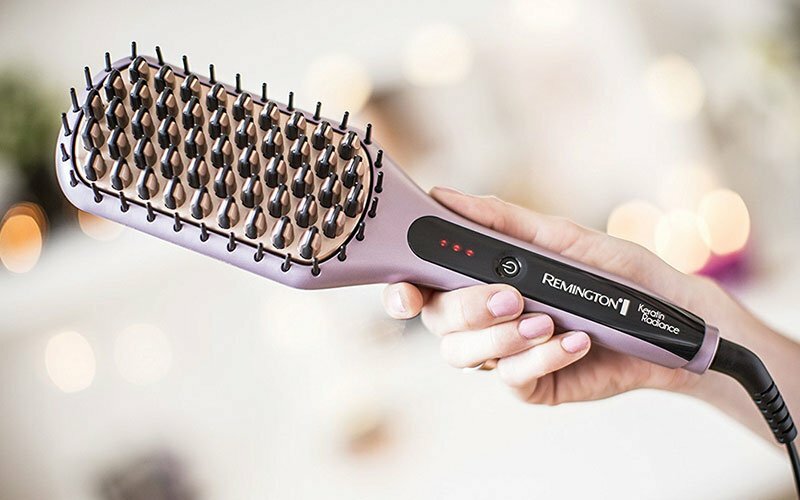 When it comes to styling your hair, you’ll find this Remington straightening brush does a pretty good job. The Keratin and Macadamia technology will keep your hair healthy and smooth during uses. In general, they keep your hair from becoming damaged–but will add a nice added shine to your hair. Also, the Keratin anti-static coating prevents frizz from building up while you run this straightener through your hair. 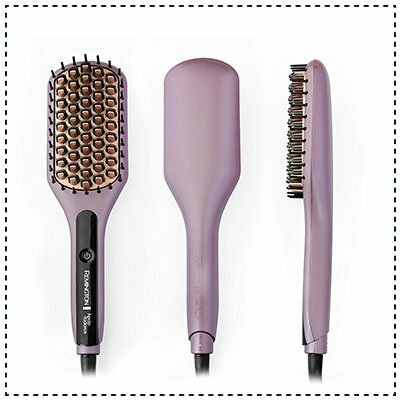 When you receive this electric straightening brush, you’ll also get a nice heat resistant mat in the box—perfect for resting this brush while it cools. Also, you get a 3-year warranty, so you’re protected should anything go wrong. And you receive an extra year when you register this product online—so it’s one of the longer warranties you’ll find. Extremely fast heat up time. Won’t get hair as straight as other straighteners. Back of brush will get hot on higher heat settings. Remington truly created a remarkable straightening brush with its latest device. If you want natural-looking straight hair fast, this is the tool for you! It’s also nice how this is one of the simplest irons on the market. If you can bear with the brush’s backside becoming hot from time to time, this product will easily be one of the best ceramic hair straightening brushes you’ll find.